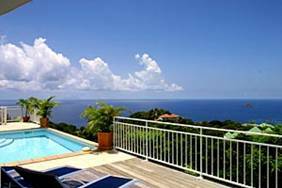 Aptly named Nirvana, this 3-bedroom villa sits on the hillside in Lurin and offers an amazing view of Saba and St. Maarten - and the sunsets are spectacular! Two king bedrooms with en suite baths are on either side of the beautifully furnished living room, and the third king/twin bedroom with bath en suite and a lovely outdoor patio is on a lower level. An indoor dining area is conveniently adjacent to the fully equipped kitchen, and guests enjoy the privacy and the views from the outdoor dining and living areas. The pool is gorgeous, and the surrounding deck is a great spot for reading and napping.